Sometimes when trendy ingredients (coconut oil, quinoa and Greek yogurt come to mind immediately) appear in recipes, our automatic reflex is to scream “super food, here I come, baby!” because all we hear is how good those foods are for us. But letta me tell you a fact. These cookies? While they do use coconut oil in place of butter and whole wheat flour for white flour, well, yeah, they’ll make your thighs jiggle just like any other cookie recipe if you eat the whole batch. Better for you, maybe, than a cookie filled with butter and bleached flour, but come on, they are still cookies (and as long as we can all agree on that, I’ll sleep better at night). Healthy or not, it’s quite impossible to resist the allure of these cookies. 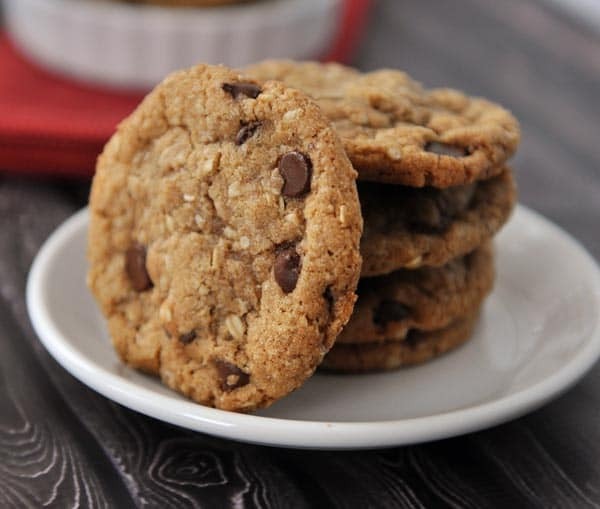 Here’s where they are different than the usual chocolate chip oatmeal suspects (which I also love heartily) – thanks to the coconut oil, these cookies have a bit more of a crisp outer shell and super soft, chewy center. If you’ve baked with coconut oil before, you’ve probably noticed that it lends a different texture to baked goods, especially cookies. I can’t get enough of the slightly crunchy outer edges and super yummy middles of these cookies especially with the oatmeal and whole wheat flour. It really is quite nearly cookie perfection. You know what these remind me of? They are the closest things I’ve had to the amazing chocolate chip oatmeal cookies at a Great Harvest bakery. Do you know what I’m talking about? They aren’t quite as big (those cookies are monstrous) but the taste is right there. I’d take an oatmeal chocolate chip cookie any day over a plain old chocolate chip cookie and these coconut oil whole wheat cookies are now among my favorites. They are dark and almost secretive in their goodness. And even though I gave that big disclaimer above about these not being health food and blah, blah, blah, I’m not going to lie, it’s a lot easier justifying a second cookie with this recipe, and when I’m really being honest with myself, my real name for these cookies is Superfood Chocolate Chip Cookies which should teach all of us that you really should never listen to me. Ever. In a large bowl, cream together the brown sugar, granulated sugar and coconut oil until light in color, 1-2 minutes. Add the eggs and vanilla and whip the mixture for 2-3 minutes. Stir in the flour, baking soda, salt, and oatmeal until barely combined - there should be a lot of streaks of dry ingredients remaining. Add the chocolate chips and mix until combined. Scoop and roll the cookie dough into 1-inch (or so) balls and place 1-2 inches apart on a lined (with parchment or a silpat liner) or greased baking sheet. Bake for 11-13 minutes until the edges are lightly golden and set but the middles are still soft. 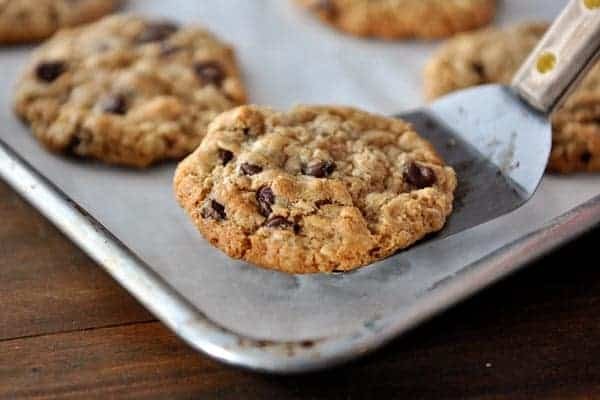 Let the cookies sit for 2-3 minutes on the baking sheets after removing them from the oven before using a spatula to place them on a cooling rack to cool completely. I haven't made these cookies with refined coconut oil but it should work also. The best way to describe the texture of the coconut oil should be sludgy. You don't want it completely melted but it shouldn't be completely solid. I usually scoop the coconut oil into a microwaveable liquid measuring cup or bowl and microwave for a couple of seconds (but usually my kitchen is warm enough that the coconut oil is the right consistency right out of the container). Also, if using freshly ground whole wheat flour that is slightly warm from being ground, either let the flour come to room temperature or else chill the cookie dough for an hour or so, otherwise the cookies will spread while baking. I haven't made these with hard red wheat (only hard white wheat) but I'm sure that would work fine also; the cookies will be slightly darker in color and a bit more heartier tasting. Finally, for those that are wondering about the oats, the reason I use both quick and old-fashioned is because I like the texture of the old-fashioned oats but using 100% causes the cookies to spread really flat - subbing out part of the old-fashioned with the quick allows the cookies to keep their soft, chewy shape while still giving lots of oat flavor. UPDATE: After a few commenters indicated their cookies weren't spreading well, I ran into the kitchen to remake the recipe and weighed the flour this time in order to get the perfect amount. I've adjusted the flour amount from 2 3/4 cups in the original recipe to 2 1/2 cups (or 11.5 ounces). It really depends on how you measure the flour and if you are using freshly ground wheat flour or storebought (which tends to be slightly more compressed). Make sure to fluff the flour and measure lightly (as opposed to measuring out super compressed flour or shaking the cup to level). Thanks to those of you who made the recipe so quickly and reported back! If your cookies are still spreading using 2 1/2 cups flour, you may be overflouring and measuring too much flour in your cup. Hi! I don’t have old fashioned oats on hand–can I use just quick oats? Sure…the cookies may not spread quite as much, but they’ll still be yummy (or you can decrease the amount of quick oats just slightly). I have ever had! ), and they’re seeing me through the first weeks with my baby boy. I’ve tweaked the recipe a bit and turned them into lactation cookies (I replace 1/4 c flour with flax seed meal and add 4 tbsp brewers yeast, for anyone interested). Eating a cookie or two when I wake up at 2am for a feeding helps make up for not getting sleep! Amazing! These have been on my “must try” list for awhile. I only had white wheat pastry flour and decided to give it a try. These came out delicious. No problems with spreading. Thanks for another stellar recipe! I love your site and the cookies came out great!! everyone at my church, including my immediate family loved them!!! However, I would like to try a to substitute the sugar with honey and or agave. Do you think you can help me with the best way to do that? Hi Kristy – I haven’t tried using honey or agave and since it’s a liquid it will definitely affect the texture and need probably more dry ingredients. Sorry I don’t have more expertise to add. Good luck if you try it! Perhaps use half coconut sugar or raw sugar instead! 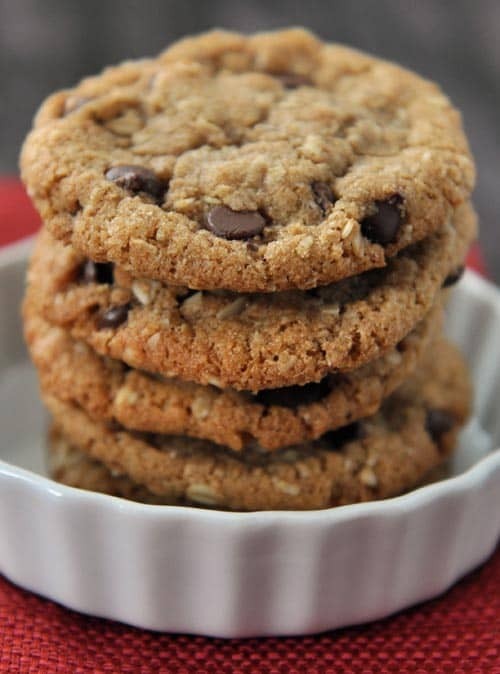 Eating one of these cookies right now… for lunch… certainly a favorite at our house!! Hearty and delicious! I made your cookies and they spread and were very crumbly. I added about 1/4 cup of white flour and some more oats to the dough I had left. I then went to King Arthur flour website on why cookies are spreading. They said to lower the temp to 300 degrees and bake for 22 to 30 minutes. I did 20 and they came out great. My son took the crumbly batch home and was going to put them in ice cream. The taste great. All of them! First time using your site. These truly are the best cookies I have ever baked! Thank you so much! I added a big handful of sliced almonds for extra crunch. Mine spread out nicely. The smell of coconut filled the air! Delicious! Ooops! I doubled this recipe but neglected to double the sugar. My kids still gave them a thumbs up if anyone is looking to reduce the sugar in their kids diet. Someone also asked about subbing alternative sugars and I almost always sub half to all of the sugar for 100% maple sryup (my son doesnt like honey) in all our cookies, pancakes, muffins, etc. Love your page, Mel! At least 75% of what comes from my kitchen is a recipe of yours. This were a huge hit at our house! I’m all for sneaking in healthy/er whenever I can. In fact, I cut the sugar down by 1/4 cup from both the white and the brown, and no one even noticed. They just loved them. Thank you!! Yes, this cookie dough freezes GREAT! I usually add a minute or two on to the baking time if they are frozen. These cookies are amazing! One of my absolute favorites! 🙂 Thank you! I am new to your site & it looks wonderful ! These cookies sound great but I am wondering if adding a cup of peanut butter would affect the amount of coconut oil required or anything of the other ingredients. I also sub honey for sugar ( reduced by about 1/2) which shouldn’t be a problem. Any suggestions would be appreciated. Thank you. 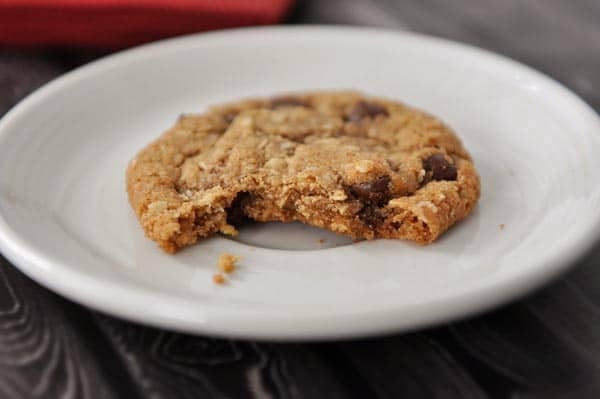 Hi Susan – I’ve never tried adding peanut butter to these cookies; I’m guessing if you did so, you could cut down a few tablespoons of oil but you might need to increase the dry ingredients just a bit. Good luck if you try it! Love love love these cookies! Do you happen to know the nutritional facts? I keep a food journal for my nutrition (on a mission to return to pre-baby weight) and I wanted to add it to it. Thanks! I am so glad you love these! I don’t provide nutritional info for the recipes, but there are some awesome nutrition calculators online. Good luck! These were perfect! Great taste and texture. They will be my standard chocolate chip cookie recipe! Loved this recipe! I followed every part, except I omitted white sugar and replaced it with half as much coconut sugar. I also added coconut shavings…yum! Mine didn’t spread…they came out perfectly…and now I’m practicing my willpower! I love cookie recipes with healthy ingredients! I used fresh ground wheat (that I had stored in my freezer). My cookies turned out a bit dry, but definitely still edible. Just not something I want to pass out to neighbors. Next time I’ll reduce the flour to two cups. Hey Stacie – always love seeing your comments pop up! I noticed the comment you left on the Butterfinger cookies that they didn’t spread out as much and then when I read this one I wanted to ask you how you measure your flour. I’m guessing you and I measure differently (sounds like maybe you get more flour in the cup than I do) which would account for the puffy Butterfinger cookies and these cookies that may have been a bit dry. These DO taste like Great Harvest cookies. Yum! I used half chocolate, half p.b. chips and coconut sugar in place of the white sugar, because that’s what I had on hand. Truly yummy and non-guilt-inducing. 🙂 Thank you! Thanks for this coconut oil edition cookie! After mixing I divide the dough into two bowls. To one bowl I add semi-sweet chocolate chips and cinnamon. To the other bowl I add cranberries, raisins and white chocolate chips. I used an ice cream scoop and baked 9 cookies at a time for 20 min. turning once after 10 min. Hope you don’t mind me sharing this with you! I appreciate so much the push to coconut oil and away from shortening/butter! Thanks again! Sounds yummy; thanks for sharing! Made these and they were a huge hit with my coworkers. Delicious!!! Hi Mel, I have everything but the whole wheat flour! 🙁 Would it be ok if I used all-purpose flour? Would it be the same measurements & time? Thanks in advance. Fernando G – Sure, white flour should work fine. I’d use the same amount (haven’t tried it myself but that’s my best guess). I am new to your site- I googled “cookies made with coconut oil”. I just made a batch of these cookies and it is my first experiment with coconut oil. They are fabulous- I know they will be a big hit! They remind me of the Kashi cookies that are so pricey! I made 95 cookies using the 1 1/4 ” scoop. I will be checking out your site more for some other healthy recipes. Thanks for sharing. Hi Beth – I’m so happy you found your way here and that you enjoyed these cookies. Thanks so much for letting me know! I substituted coconut palm sugar for all the sugar in this recipe today and the cookies turned out perfect! I have a sweet tooth that isn’t going away anytime soon so I’m always looking for lower Glycolic index/ less refined sugar options. These are my new favorite cookies!! I made them as written with bagged flour that I measure and shake until level, if that makes sense, and they were perfect. I also used room temperature coconut oil that was perfectly “slushy”. I wonder if the variance in coconut oils is part of the spreading problem for some? I have two different brands, but one of them is always rock solid. Anyway, they were absolutely delicious and a little bit more guiltless. 🙂 Thank you!! These turned out great for me! Just like the picture (only mine were studded with walnuts). I weighed my flour then measured just for kicks– 11.5 oz. was only 2 cups for me. So thank you for the weight equivalent! Hi Mel! I had a FABULOUS experience with these cookies! I’m making them again today. Thanks for all your great recipes. My family and I love your blog! Hi Kim – although there have been a few people who have reported that their cookies didn’t spread, many others have reported great success with this recipe so I’m sorry they didn’t work out for you. I’m happy to answer any specific questions you have about other recipes that may not have worked out (I don’t think you’ve commented before if I recall correctly) but it sounds like my recipes may not be a good fit for you. Sorry to hear that! Hope you stumble upon a goldmine of fabulous recipes elsewhere that suit your cooking style better. I weighed the white whole wheat flour (11.5 oz), and my first pan of cookies didn’t spread enough. For the remaining dough, I rolled the dough into balls, and then flatted them slightly before baking. Worked like a charm! Perfect looking and tasting cookies! Great recipe! I made these and they were so so good, my new favorite cookie. I actually added some shredded coconut like you do in my former favorite cookie recipe from your site. They are so good I can’t stop eating them. Not to further complicate things, but I wondered if I were to blend my oats first (my kids don’t like the texture that unblended oats add) would you still measure out the called for amount and then blend? And if blended, does the type of oat really matter? Jill – that’s a good question and one I don’t really know the answer to since I haven’t tried it with these cookies. Other cookie recipes I have where the oats are blended – the amounts are a bit different, I think because the blended oats act more like flour instead of, well, like oats. If you decide to experiment, be sure and report back. I think if you are going to blend them, it doesn’t matter what type of oats you use (my gut feeling is to cut down on the amount of oats and then blend so the cookies spread instead of staying in the shape of little balls). I made these cookies and they were divine!!! I loved the hint of coconut in the flavor and the texture was perfect! I weighed my flour and since I didn’t have any whole wheat flour I just used my go to turkey flour. They were a family and neighbor hit!! Thanks for your awesome recipes!! My Mom and sisters talk about you as if we know you :). I made your chocolate cake the other day and told my family “it’s Mel’s recipe” and they all just smiled and said “you and her just need to be best friends”! I love that these use coconut oil and whole wheat flour; they look perfect to me! Oh shoot, Anupa! I had a feeling that altering the directions to help the not-spreading issue might backfire the other direction. I live at low altitude too and the weight measure I gave works perfectly for me – the 11.5 ounces and 2 1/2 cups – so it sounds like maybe you don’t need to measure quite that lightly. Sorry it’s so confusing! I want them to work perfectly for everyone! Sorry, this has nothing to do with this recipe. I have been assigned homemade rolls for next Friday. The occasion is MORP (prom backwards = middle school dance). We are doing a homemade dinner for a group, and I’m the only one who does bread. I need to make the dough Thursday and refrigerate until Friday afternoon. Can you recommend one of your recipes for this? Thanks! Lillie – I would recommend the French Bread Rolls. Good luck with all of your MORP bread baking! Thanx for cutting to the core of the apple—-ya can’t get too many of these babies. I do something similar, but not with coconut oil. I was most interested in regard to your observation about the texture. Sounds delish! I haven’t been cooking with coconut oil, but man alive it is popping up EVERY WHERE as you know. I love working with coconut oil. Love that these are whole wheat. Yummy! Have a beautiful weekend Mel! Yeah! A delious cookie I will eat with less guilt! Mel- thank you for all that you do to tweak and perfect your recipes so they are fool proof (and amazing) for your blog readers! I made these tonight, and they worked perfectly! They spread just the right amount (I went by flour weight), and are delicious! My one question though is what size dough ball do you use. I have a 1, 2, and 3 tbsp. cookie scoop and go by that instead of by inches. I used the 2 tbsp. scoop (which seemed about 1 inch) and got 32 cookies for a half batch! That would’ve yielded 5 dozen for a whole batch, which leads me to think that you’re using bigger scoops than I am. Thoughts? Michelle – I’m pretty sure the cookie scoop I have is around 2 tablespoons. I must be using bigger scoops or filling my cookie scoop overloaded because when I made this batch again last night I got 3 dozen right on the nose for a full batch. Made these cookies this afternoon and they were so yummy! I halfed the sugar and they still turned out great. I baked some and freezed the rest of the dough for another day. Thanks again! Your recipes are always a hit! Would the cookies still turn out okay if the sugar was cut in half? Would it work with coconut palm sugar? Your recipes are so good. Thank you! Hey everyone! Thanks for your patience on this recipe. I made the cookies this afternoon because it was bothering me that a few of you had issues with the cookies not spreading. I definitely think, after making them just now, that it boils down to how much flour is measured. I used freshly ground flour and made sure that it wasn’t overly airy (which can happen when you measure freshly ground flour). I dropped the amount to 2 1/2 cups but kept all the other ingredients the same. Just to be safe, I weighed the flour in case that helps other people and the cookies turned out great. They spread great – maybe even slightly more than I like them (I tend to like a thicker, softer cookie) – but because it seems to be an issue, I’m going to edit the recipe to state 2 1/2 cups flour (or 11.5 ounces) but now we know if you want a slightly thicker cookie, you can use about 1/4 cup more flour. For those not using a scale, my recommendation would be to measure the flour lightly – definitely don’t compress or shake the flour into the cup. The cookie dough should not be crumbly. It should resemble a regular oatmeal cookie dough – soft and just very slightly sticky (not overly so). Hope that helps! Thanks to those of you who made this recipe so quickly and reported back. So helpful! Mine didn’t spread out at all either. Used 2 1/2 C flour, followed the rest of the recipe as stated. The raw dough was almost crumbly before baking, it seemed too dry. (I used bagged white whole wheat flour, I fluffed it, and do not live @ high altitude.) If I was making these again I would decrease oatmeal and flour. I just made these, and while they’re really yummy, mine didn’t spread either! I prefer flat, spread out cookies, so I used 100% old-fashioned oats, but they’re not nearly as flat as the ones in the picture. Hmm…maybe too much flour? I used bagged white whole wheat and scooped it from the bag. Shoot, Suzanne! Sorry to hear that. It’s strange that your cookies and Melanie’s didn’t spread since I had the opposite problem with this recipe – they spread way too much so I upped the flour! I left a comment back to Melanie about the flour/oats issues so take a look a that, but basically it sounds like too much flour (maybe based on how we are all measuring?). I’ll edit the recipe to let people know if they are worried about cookies not spreading to either use 1/4 to 1/3 cup less flour or measure very lightly. Do you happen to live at high altitude? Thanks for your reply! Nope, not high altitude – Chicago 🙂 I do want to add that my kids (6 year-old twins) love them, and said they’re the best cookies they’ve ever had! I have just purchased a whole wheat pastry flour. ….. how do you think this will work with this recipe? Not sure, Lea, since I haven’t tried it but I think it’s worth experimenting. Whole wheat pastry flour has a finer texture and I think might have a slightly different protein content but if it were me, I’d use it instead of having to buy another type of whole wheat flour. Love, love, love your recipes first off! I had a question and/or request for you… 🙂 Have you had any experience with baking and using substitute sugars (i.e. honey or stevia)? I was gestational diabetic with my second pregnancy and now have a 50/50 chance of becoming a type 2 diabetic later on in life! So, I’m trying to find and experiment with recipes to find healthier (but still fun and tasty!) alternatives however, I am years behind you in my ability and knowledge! You have a true gift for recipe tweaking and inventing so I wondered if you’ve got any ideas up your sleeves or are up for a challenge!? 🙂 Thanks! Hi Sara – I can totally understand where you are coming from. Unfortunately, I have very little experimenting with stevia and alternative sugars. I’ve started using agave nectar quite a bit more (since the glycemic index is lower) but I usually use it in our smoothies or recipes that call for honey so it’s a really easy swap 1-for-1. If I find any great resources or other sites that are more knowledgeable, I’ll definitely pass them along to you! I would love any ideas/resources you might know of or come across, thanks again! I’ve been substituting honey for sugar in all of the recipes I’ve tried on Mel’s site, and it has worked great. Honey is sweeter so I usually do half the amount called for. I’ve tried lots of recipes with honey and the only time I think it didn’t work super well was with the Ginger Crinkle Cookies, they were good but I think using honey changed the texture some. For more advice you can check out this site http://wholenewmom.com/whole-new-budget/baking-with-honey-sugar-for-baking/. Thanks for all the amazing recipes Mel! Love this tip, thanks, Julie! I know a lot of people are trying to use natural sugars like honey and it’s nice to know there are resources out there. Thank you! I made these cookies yesterday and they turned out so good. I only made a half batch (halved everything exactly and only used 1 egg) but I substituted honey and a little molasses for the brown sugar. I put 1-2 teas molasses in a 1/2 cup measuring cup and filled the rest with honey. I was worried about substituting all of the sugar with honey because I’ve never done that with cookies before and didn’t know what the consistency would be like. I was pleasantly surprised and now I can’t stop eating them. Thanks for being a better version of me. I love the tidbit about quick and old-fashioned oats – great tip! And I have wanted to experiment with coconut oil in cookies, so thanks for saving me the hassle (I say hassle, because mine wouldn’t have turned out so well as yours!). I need a good ‘different’ chic. chip cookie and this might just be it – I will give them a go this weekend. Hi Mel – I just made these cookies, and while they taste divine, they did not spread very much at all during baking. I pressed the balls down lightly on the second pan and they were a little better. Just wondering if this could be due to the ratio of dry ingredients to wet. Or, possibly because I used store-bought ww flour (I do not have a grinder to grind my own). Just wanted to get your thoughts. One more things – just to echo the comments of many others, I LOVE your blog. As a Mom to 5 boys, this is my go to site for recipes that I know they will all enjoy. Thank you for all of your hard work!! Hi Melanie – thanks for checking in on this recipe (plus, I love hearing from moms of lots of boys!). Hmmmm, the not-spreading issue is probably due to the dry ingredients. Both the original recipe I adapted this from (a whole wheat chocolate chip oatmeal cookie on my site) and this recipe when I was testing it resulted in thinner, spread out cookies which is why I upped the flour just slightly (by 1/4 cup) and used a combination of quick and old-fashioned oats. When I made them like that, they definitely kept their shape instead of being kind of lacy and thin. Freshly ground whole wheat definitely has more air to it but I tested this recipe after letting the flour sit for a while to compress a bit. How do you measure your flour? I fluff up the flour and then lightly dip the cup in and level off. It sounds like maybe your cookie dough had a bit too much flour. Bagged whole wheat flour from the store is definitely more compressed and dense than home-ground but if you fluff it up before scooping that will definitely help. 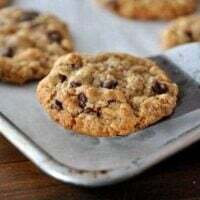 Maybe next time (if you dare make them again) you could use 2 1/4 or 2 1/2 cups flour and see how that goes (or use 100% old-fashioned oats – they don’t absorb as much wetness as quick oats). Sorry they didn’t work out quite right for you! My cookies turned out the same. I used home ground flour from hard red berries. Maybe it has something to do with the altitude or humility? Although, my husband and kids ate all these up (okay, me too) so I don’t think they were bothered by the cookies not spreading. Djallen – Did you see the note about altering the flour just slightly? If you didn’t weigh the flour amount it might be due to too much flour in the measuring cup. Sorry they didn’t spread out. I am glad your family still ate them though. Is it possible to just use quick rolled oats instead of old fashioned oats? Or vice versa? Usually I only have one of those on hand. Thanks! Hi Jenni – in the notes of the recipe I explained a little bit why I use a combination but you could certainly experiment. All old-fashioned oats may cause the cookies to spread a bit more (conversely, all quick oats may make it so the cookies don’t spread much). Good luck if you experiment! You are a woman after my own heart! I love whole-wheating things up, but only if they taste just as good as the original. I can’t wait to give these a go for my family! The way you were describing them in the beginning made me think of Great Harvest cookies! So it wasn’t surprising to me that you compared them to that. I love those giant cookies! These look great! Yep, a dessert is a dessert but how neat when you find one that offers some nutritional value (whole grains and a better fat). You always excel in your work!